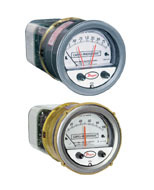 Series 43000 Capsu-Photohelic® Switch/Gages function as versatile, highly repeatable pressure switches combined with a precise pressure gage employing the time-proven Magnehelic® gage design. 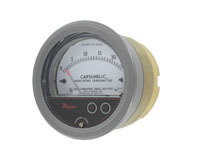 The Capsu-Photohelic® switch/gage employs an encapsulated sensing element for use with both liquids and gases at pressures to 500 psig (34 bar). Optional cast brass case is available for water or water based liquids. Two phototransistors actuated, DPDT relays are included for low/high limit control. 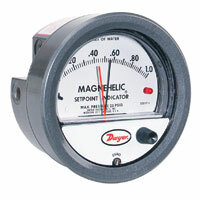 Easy to adjust set point indicators are controlled by knobs located on the gage face. Individual set point deadband is one pointer width — less than 1% of full scale. 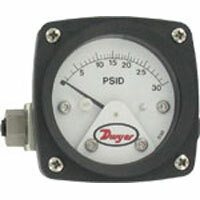 Set points can be interlocked to provide variable deadband — ideal for control of pumps. Compatible gases and liquids. Brass case option required for water based liquids. ±3% of FS at 70°F (21.1°C). ±4% on 43215, 43220 and 43500. 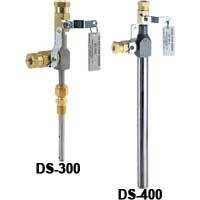 -20 Hg to 500 psig (-0.677 to 34.5 bar). 20 to 120°F (-6.67 to 48.9°C). Low temperature option available. 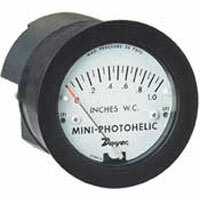 4" (101.6 mm) dial face, 5" (127 mm) OD x 9-3/16" (233.36 mm). 5 lb. 8 oz (2.49 kg). Brass 11 lb. 2 oz (5.05 kg). Each setpoint has 2 form C relays (DPDT). 10 A @ 120 VAC, 6 A @ 240 VAC, 60 Hz res. 10 A @ 28 VDC. 120 VAC, 50/60 Hz; 240 VAC & 24 VAC power optional. Diaphragm in vertical position. Consult factory for other position orientations. 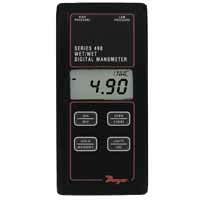 Time-proven, simple, frictionless movement that permits full scale readings as low as 0.5 in w.c. 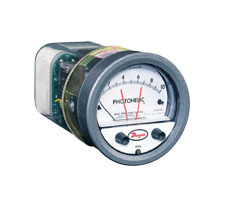 EXAMPLE 43000 B -0 24VAC Series 43000B-0-24VAC Capsu-Photohelic® Pressure Switch/Gage, range 0-0.5" w.c., brass case, with 24 VAC relay pack. Remote Mounted Relay Std. 5 Ft. Remote Mounted Relay 1 Ft. Remote Mounted Relay 2 Ft. Remote Mounted Relay 10 Ft. Remote Mounted Relay 15 Ft. Remote Mounted Relay 20 Ft. Remote Mounted Relay 25 Ft. Remote Mounted Relay 30 Ft. Remote Mounted Relay 40 Ft. Remote Mounted Relay 50 Ft. Remote Mounted Relay 60 Ft. Remote Mounted Relay 70 Ft. Remote Mounted Relay 80 Ft. Remote Mounted Relay 90 Ft. 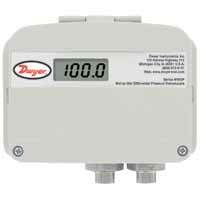 Remote Mounted Relay 100 Ft.
What is the NEMA rating of a Photohelic®? Our standard is considered to be NEMA 1 rated for general purpose. 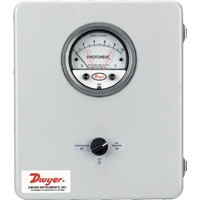 We do have weatherproof (NEMA 4X) and explosion-proof (NEMA 7 & 9) enclosures available.